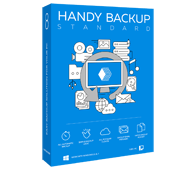 Handy Backup is a perfect data synchronization solution, capable to sync data between two folders located on your PC, on an external device plugged into USB or stored on any popular network service including cloud services such as Windows Azure, OneDrive or Amazon S3. Sync for cloning. One dataset is deliberately selected to be a clone of another (master) data array. Synchronizing between these datasets allows a clone to be an exact copy of an original. This can be useful for, say, cloning one database to another server. Sync for coordinating. Instead of simply clone the dataset, this technique compares and merges the content of each dataset to another, merging it for both data arrays. By this way, computers, mobile devices, laptops and even servers can maintain a common set of actual data. Sync for backup. Just an example of cloning, where data are synchronized for backing up, not for immediate using. Source overrides destination. This method completely replaces a destination dataset with source data. Destination overrides source. Source data are renewed according to the information kept on the destination. Merging datasets into an actual state. Both data sources are compared and the newer data from each source will be transferred to another. This method allows an optional programming, setting up an order of replacement for datasets with identical names. This common type of synchronization is designed for keeping two folders identical. User can synchronize files over the Internet, via the network or cloud-linked folder like Google Drive, Skydrive, Azure or OneDrive local folder. It allows maintaining an actual data state between the two drives, e.g. local and remote disk or local and network drive. User can also synchronize files to USB, plugging the external drive in some USB port for synchronizing data. This implementation requires syncing between a particular folder that belongs to some user, and a common or shared folder where data from all users have to be collected. It can be useful for multi-user designs and projects. Mobile synchronizing allows saving some valuable space on the mobile device (e.g. smartphone), keeping some important but not-too-frequently used data on the more storage-capable PC. Handy Backup is the fully-automated backup, restoration and data synchronization utility. It is capable to synchronize files under all versions of Microsoft Windows, including Windows 10, Windows 8.1, Windows 8, Windows 7, Windows XP, as well as under any server edition of Windows. High speed and reliability of synchronization job. Every version of Handy Backup, starting with the most popular and affordable Handy Backup Standard, can synchronize your data, always keeping all your vital information in actual state. 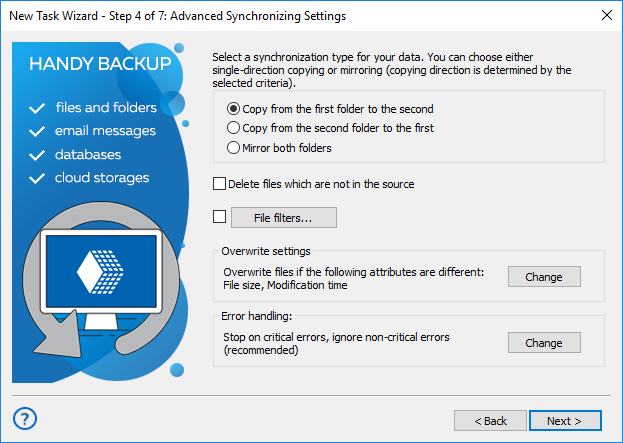 To create a task that will synchronize the files between two folders, please open Handy Backup, create a new task and select a synchronization task option on a Step 1. Then select first and second folders, set up synchronization parameters, scheduling time and other task options. All steps for creating a data synchronization task are described in details in the User Manual. Please see the manual for any specific question about synchronizing files and folders via Handy Backup. Try Handy Backup as your personal data synchronization solution just now, downloading a completely free 30-day trial version with full set of functions available for backing up, restoring and synchronizing your information!